He's all-new, he's high-def, but he's still 2D! Ha; take that, The Man! 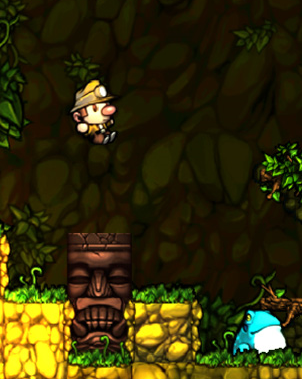 Hot on the heels of the last post, pictures from the much-anticipated XBox360 port of the Best Game Of The Last Ten Years (That I Have Played) Spelunky have finally been released along with some hints at what can be expected in the finished game. Along with the terrific, procedurally-generated gaming that we all know and love new features for owners of Microsoft’s notoriously prone-to-breaking-down console include: dynamic lighting, achievements and “new game modes”. Naturally, the graphics have been given a thorough makeover (as you can doubtless see, assming you’re not prone to completely ignoring the pictures I attach to posts here) described as “hand drawn” that nonetheless seem to retain the character of the originals. I’d say I can’t wait only I don’t have an XBox360 and so I’m incredibly jealous. You lucky bastards, etc! For more details and more pics, visit Spelunky World.